Natural gas development in the Appalachian Basin continues to reshape the domestic energy landscape, as recent production reports from the region illustrate. New figures released by the Ohio Department of Natural Resources show production in the Buckeye state set a new state record in the latest quarter. Likewise, a recent report out of Texas shows Pennsylvania’s upward trajectory as a natural gas producer. And projections from the Energy Information Administration for March show natural gas production across the basin is set to exceed last month’s figures. According to EIA, this continued growth across Appalachia, coupled with the increase in LNG trade and growing demand in the South, is altering the flow of natural gas across the United States, and will do so increasingly in the years ahead. 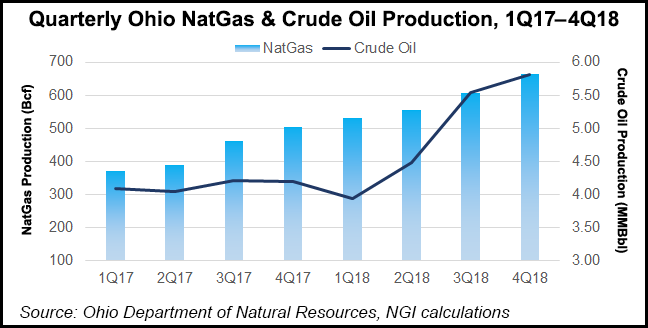 During the fourth quarter of 2018, Ohio produced 663.5 billion cubic feet of natural gas – up from 605.7 Bcf the previous quarter – marking a new state quarterly production record and a nearly 32-percent rise over the same period in 2017. For the year, the state produced 2.4 trillion cubic feet of natural gas – up from 1.7 Tcf in 2017 – the first time the state has produced more than 2 Tcf since shale development began. Neighboring Pennsylvania continues to close the gap with Texas as the nation’s top producer of gas. The Texas Independent Producers & Royalty Owners Association’s 2019 State of Energy Report shows Pennsylvania as the No. 2 producing state, with 6.1 Tcf of natural gas produced in 2018, up from 5.4 Tcf produced in 2017. Ohio’s increasing production, along with continued successful development in neighboring West Virginia and Pennsylvania, has the EIA forecasting the Appalachian region will produce 31.6 Bcf/d of natural gas in March, compared to 31.2 Bcf in February. 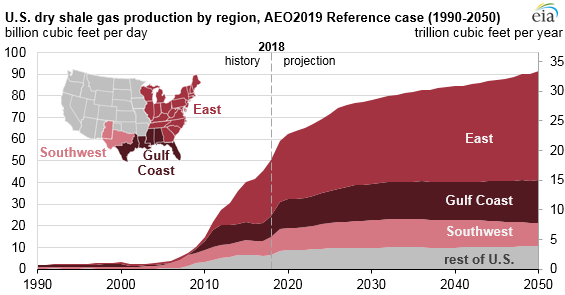 Looking farther out, EIA’s 2019 Annual Energy Outlook (AEO2019) projects the region will continue to lead the nation in natural gas production through 2050. This rise in Appalachian production is causing a further shift in the flow of natural gas. 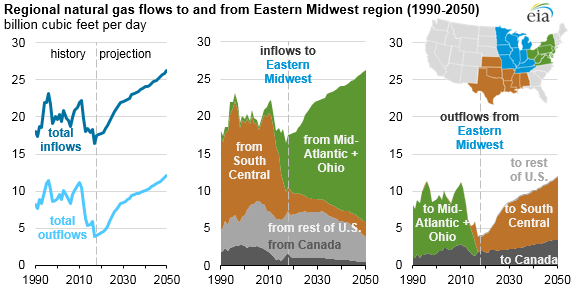 Historically, the populous Eastern Midwest and Mid-Atlantic regions have been fueled by natural gas imported from the South Central region (which includes Texas and the Gulf Coast). 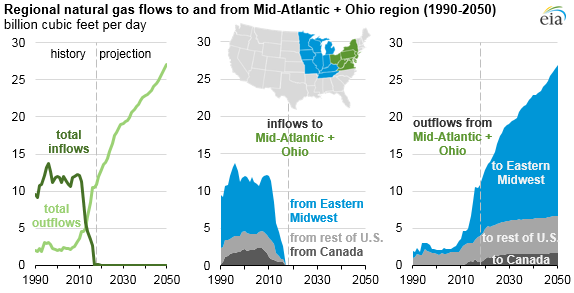 The flow of gas began to shift as the development of the Marcellus Shale took off, allowing the region to meet an increasing amount of its own demand. According to EIA, in 2008, flows into the Northeast averaged 12 Bcf/d. By 2013 these volumes dropped to 5 Bcf/d and today, with over a decade of development in the Marcellus and continued growth in the Utica, the region is a net natural gas exporter (primarily to the Eastern Midwest). Once reliant on southern states and imports for its natural gas needs, the Midwest is increasingly fueled by Appalachian-produced gas. Further out, this abundant Appalachian supply is expected to flow south. As the United States continues to expand its role as a leader in LNG exports, the South Central region – despite having its own resources – is projected to become increasingly dependent on other regions. As EIA projections show, no region is better positioned than the Appalachian Basin to fill the demand for natural gas. With continued success in Marcellus and Utica Shale development and growth in the South Central region’s role in global LNG trade, EIA forecasts an incredible shift in natural gas flows in the coming years. As needed infrastructure continues to build out, regional energy successes are becoming increasingly intertwined. Success in Ohio – and across the Appalachian Basin – is poised to have outsized benefits far beyond state or even regional borders.